We are a leading Manufacturer of swimming pool life buoy from Mumbai, India. Swimming Pool Life BuoyUltra Safe Lifebuoys are manufactured from high-density UV grade polyethene and is polyurethane foam filled.The lifebuoy comes fitted with reflective strips and nylon "grab ropes" as per standard. The diameter of the ropes is 8 mm with breaking strength of not less than 5-kilonewtons. The Buoy is manufactured in Orange and is durable and UV resistant. Ultra Safe Lifebuoys are highly durable, moisture proof, non-inflammable and require no maintenance.Ultra Safe Lifebuoys are rot-proof and resistant to deterioration from sunlight exposure, oil or oil products, salt water, and anticipated weather conditions encountered at sea. 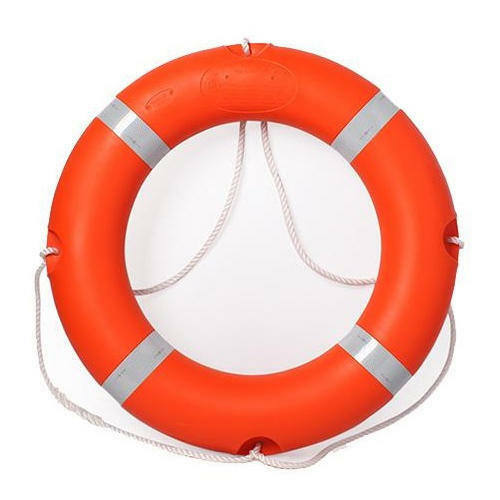 Looking for “Swimming Pool Life Buoy”?